There was a lot of pressure on last night's dinner. The night before we had a disaster dinner. We'd gone to see Julie & Julia and, since we didn't have time to make Boeuf Bourguignon, we decided to splurge on the ingredients for a really good Carbonara. If I hadn't burned the pancetta into gross little bits of fat/stryofoam I would be putting that recipe on right now (it's so rich and easy). 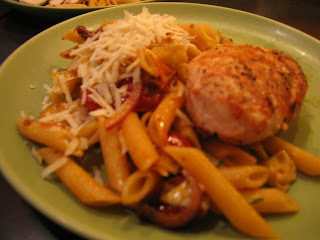 So then, last night as I was throwing together a pantry pasta to go with the best, simplest grilled chicken (I'll turn that into a link soon) I was worried that it would flop again (we had bad burritos earlier in the week and once in a while we go on a stretch of disaster dinners). Nope, this is one of our new favorites. Start this super-fast sauce when you put the pasta in the water. Most short pastas cook in about 10 minutes and that's about how long this sauce takes. In a large pan, saute the onion in a good bit of olive oil (a little more than is really necessary because this will be part of the sauce) until it is just starting to brown. Add the garlic and saute until it's also starting to brown. Add the rosemary, tomatoes, and artichoke hearts. 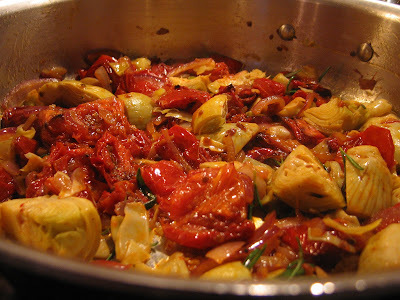 If you're using canned tomatoes, cook out some of the liquid before adding the artichoke hearts. When the pasta is done you can either snag about a 1/4 of the cooking liquid and add it to the sauce or just do a bad job of draining it and enough liquid will still be with the pasta. Either way, add the pasta and some of the cooking liquid into the sauce. Check the salt and pepper levels and adjust as needed. Once you plate it, sprinkle generously with grated Parm. This is perfect side for best, simplest grilled chicken (link soon), or as a vegetarian dinner (Hi Kelly). Oh! I want the carbonara recipe! I've NEVER believed that could be an easy one, though everyone says it is. I will post it soon. It is the easiest Carbonara ever. I was so surprised. If it hadn't tasted little crapazoo because of the burnt Pancetta it would have been so good.